SEASONAL: I’m guessing it is because the winters here can be brutal. That too is a guess. Call the city and ask (phone number below). This is the city web page and doesn’t really say anything specific about the campground. ACCESS: Roads to the park are paved. The short road in the park is dirt and gravel, in good condition. SPACING: Tight. All 4 sites are side-by-side and rigs with slides could create problems for each other. TENT PADS: No. Tents are pitched on the gravel parking aprons. HOOKUPS: Water and electricity, but the spigot for my site wasn’t working properly. I had to use the water spigot in the next site. CALL THE CITY TO HAVE THE ELECTRICAL PODIUM UNLOCKED. They will send out their maintenance worker to take the padlock off. I waited maybe 5-10 minutes after I called. You’ll want to call before the city offices close for the day. I don’t know what happens on weekends. Call ahead of time. I saw sewer hookups but I don’t think they were operational. Check with the city. One neighbor found a pedestal unlocked on arrival. He also stayed several days without paying, apparently unaware there was supposed to be a fee after the first night. Apparently the city hadn’t been vigilant in monitoring. ELECTRICAL QUALITY: My surge protector reported 124 volts, 60 Hz, no errors. CELLULAR: 1-2 bars and 4G on my AT&T iPhone 5s. I was able to stream video (albeit with some intermittency) which surprised me because download speed was only .54 Mbps, upload .08. 2 bars and LTE. On my Verizon iPad Air, 11.78 Mbps download; .52 Mbps upload. RESTROOMS: Sort of… The men’s room urinal did not have water to flush, but the toilet did. The sink had cold water. There were paper towels but the soap dispenser was empty. The men’s room is what I might call “country funky”. This is a small, rural community. That they have a park to begin with is a wonder. BUGS: There were a lot of mosquitos when I rolled into the campground in late September. I was told they’d be spraying in a few days. A wind came up shortly and blew them away. Later my neighbor told me they’d been spraying at night each of the previous 2-3 days. 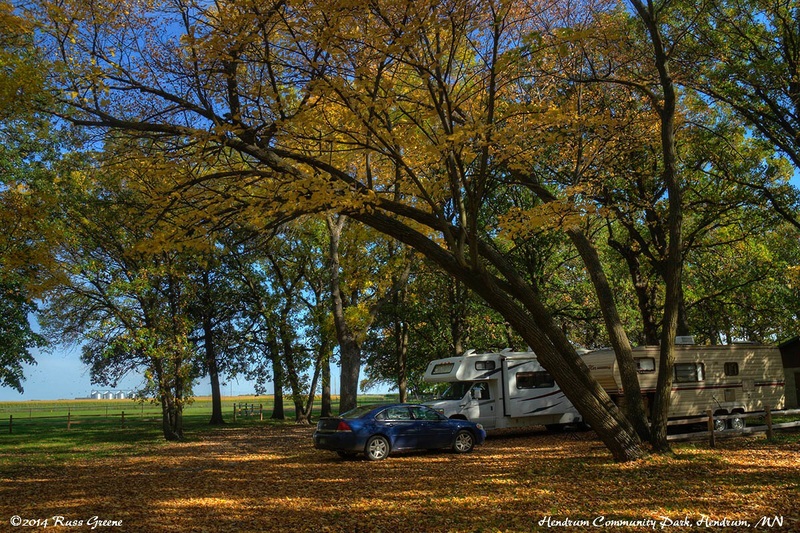 There are only four campsites here at Hendrum Community Park. Three of them were occupied when I took this photo. 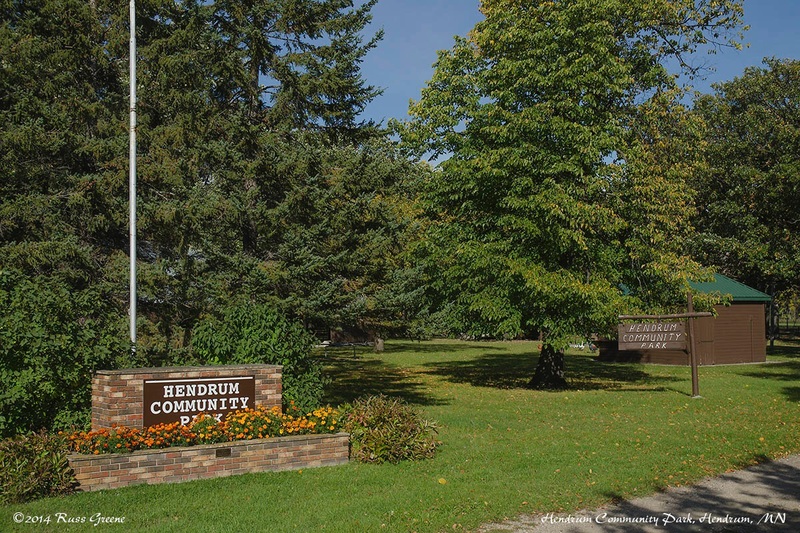 Hendrum is a small town in MN about 20 miles north of Fargo, ND. By all appearances it is a farming community with corn the main crop. There is no restaurant in town although there is a bar. The park has the feeling of suffering from some neglect, the men’s room serving as an example (comments above). Still, that a town that seems so small has any facility to accommodate campers is impressive. That they do so for a night for free, including electricity and water is extraordinary. Thank you Hendrum! You rock. The 4 campsites here are side-by-side sharing a single gravel pad with naught but a 4×4 length of wood laid on the ground between them. The sites are not wide, nor long, and one has its access made difficult by a large cottonwood tree and picnic table, the latter of which I suppose could be moved if with some difficulty. All sites are on gravel. Each has an electrical pedestal that requires unlocking by a city maintenance worker and that in turn requires stopping by the city office at 308 Main St. or making a phone call to the number above. These pedestals are equipped with 20, 30 and 50 amp outlets. There is also one pedestal that that did not lock. It had only a 20 amp outlet, but I could not get my multi-meter to show any current to the receptacle even though an LED on the side of it glowed. That may be more a statement of my electrical prowess, or lack thereof, than anything else. The park has a basketball hoop on a grass lawn. There are monkey bars, a sliding pond, see-saws and a few other things for kids. There’s a baseball field with small wooden bleachers adjacent to a corn field. “If you build it they will come” came to mind. Two large open-sided shelters are in this small park. One has about a dozen picnic tables in it. The other was essentially empty. Both have raised stages at one end and I imagined the locals coming to the park on the 4th of July, kids on the see-saws, the older ones playing softball, adults barbecuing in the large BBQs in the park; families and neighbors sitting down to eat in the shelter with the tables, then dancing the night away to the music of the local band in the other structure. I painted a real Norman Rockwell in my imagination. However, I was there on a weekday in late September. Apart from the tent campers on one side of me and a 5th wheel on the other I saw nobody at all in the park–in stark contrast to my Rockwell fantasy. After I got settled a couple of thuggish looking young hispanic men rolled up in their car, apparently belonging to the tent next to me. One was a big in all dimensions, the other slight but muscular who walked with a cocky, hormone-infused strut symptomatic of young toughs. Although I could not understand what he was saying one of them was being loud. I reached into the bin where I keep my camping supplies and pulled out my bear spray… just in case. It’s not a gun but it will stop a man at 30′ without doing any permanent damage. I saw they were breaking down their tent, getting ready to move on. I was relieved. I stepped out of my RV to test the electricity on the 20 amp pedestal I mentioned earlier intentionally avoiding eye contact with them and as I did the big man turned toward me and called out “hello neighbor” as he beamed a smile in my direction. It turned out he was a very nice and friendly young man… as a thug, a total failure. My plan was to spend a night in Hendrum on my way from Jamestown, ND to the Chippewa National Forest in MN which was more of a drive than I’d care to make in one day. 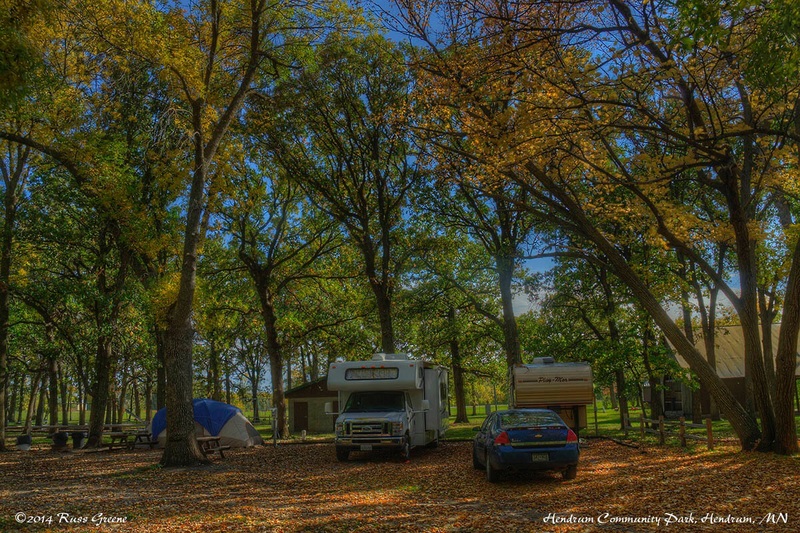 Another route offered a Passport America campground at $12.50. Each route was roughly the same mileage but the one I chose was more of a backroads route which is more my style than the Interstate. It also offered a free campground which is definitely more my style.